Colorado online Stream flow information. The SNOW WATER EQUIVALENT Percent of Average represents the snow water equivalent found at selected SNOTEL sites in or near the basin compared to the average value for those sites on this day. The TOTAL PRECIPITATION Percent of Average represents the total precipitation (beginning October 1st) found at selected SNOTEL sites in or near the basin compared to the average value for those sites on this day. The Dolores Water Conservancy District uses the El Diente Peak, Lizard Head Pass, Lone Cone and Scotch Creek sites for averages in the Dolores river basin. The reference period for average conditions is 1971 – 2000. Bureau of Reclamation Basin/Reservoir Data. Information related to Montezuma County. Information related to The City of Cortez. Information Related to the Town of Dolores and surrounding area. 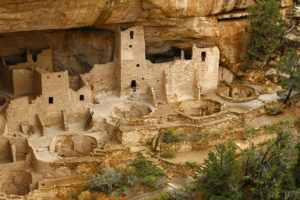 Museum of the Ancestral Puebloan culture and other cultures in the Four Corners region. Public information sponsored by local water districts, organizations, and agencies.